What would Gujarati food be without shrikhand? Shrikhand, for the uninitiated (and the unfortunate, I must add!) is thickened, sweetened, flavored curd (yogurt). Now, that definition does not convey even a tenth of what shrikhand actually is! But, in plain English, that's what it is. Shrikhand is prepared by letting curd hang in a cloth and let most of the water dribble out. May take a few hours. This process is so important. Let it stand for too long and it becomes too thick. Take it out too soon and it is too thin. The consistency is an extremely important aspect of shrikhand. Once this is done, sugar is added and flavors that give it its rich taste and odour are added. Kesar (saffron) and elaichi (cardamom) are the most widely used. Chopped almonds and pista are usually used for garnishing. 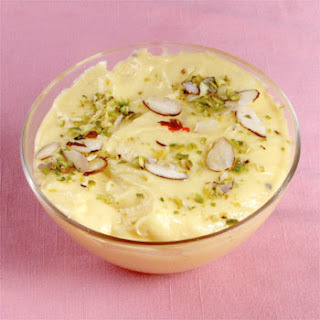 Variants of shrikhand include fruit shrikhand (diced green grapes alone, pomegranate alone or a mixture of different fruits) and amrakhand (mango flavoured shrikhand). There are many places in Hyderabad where you can get good shrikhand. But my favourite is Panchratna Dairy which has branches in Koti and Prenderghast Road, Secunderabad. There is one place in the lane opposite the Venkatramana theatre in Kachiguda which makes amrakhand to die for. I forget the name. Will update the post when I remember.